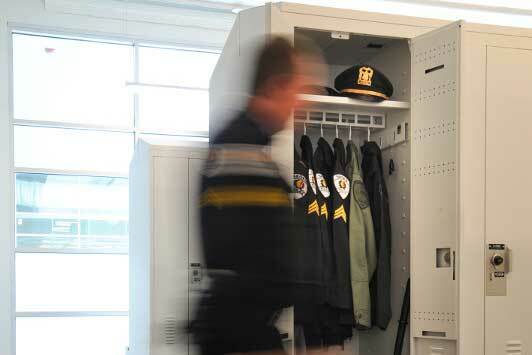 Law enforcement agencies, courthouses, crime labs, corrections facilities: they focus on distinctly different aspects of public safety, but their overall priorities are the same—maintaining security and establishing efficiency in their departments. It might seem unrelated, but storage can help this priority. 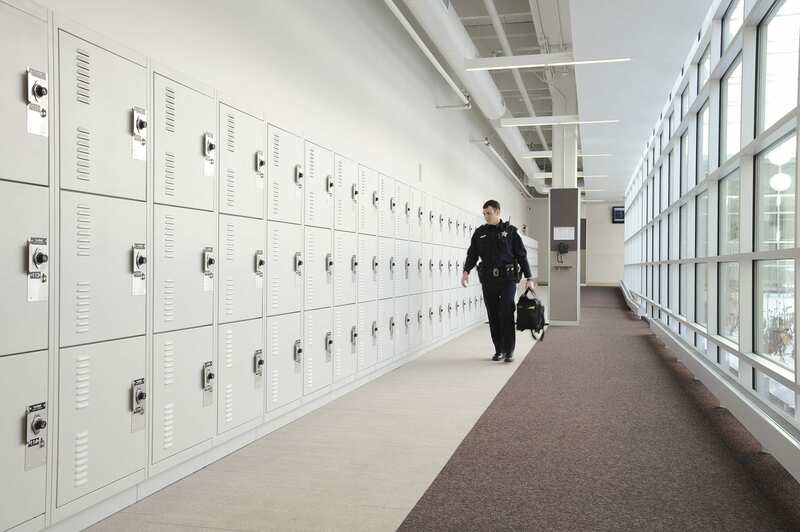 There’s no shortage of important items to store in a public safety facility—from evidence and weapons to gear and records—and with over 45 years of experience in partnering with public safety entities, Bradford Systems knows that an organized space can make a big difference in serving a community. It certainly did for the Skokie Police Department. 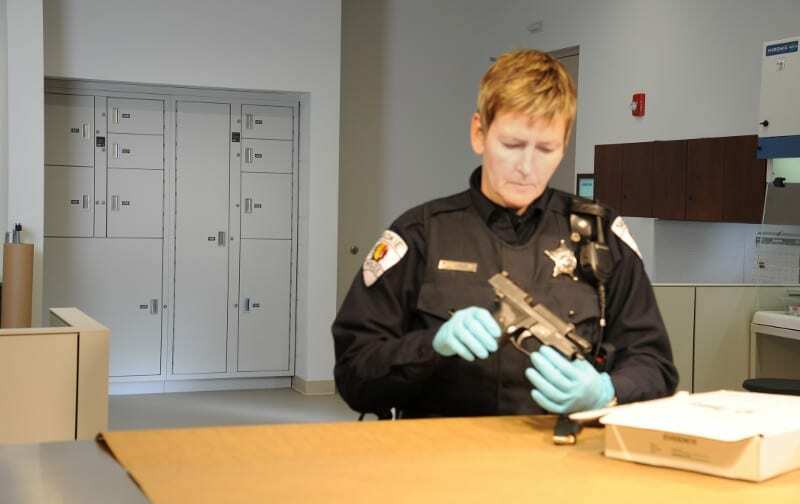 Located 16 miles of Chicago in the village of Skokie, Illinois, the department had outgrown its facility and just didn’t have the storage needed to accommodate a growing police force. When the village decided to go ahead with a plan to convert an abandoned 80,000 square foot bottling plant into a state-of-the-art-headquarters, they knew they’d have a chance to build a space that was perfect for their department’s needs. 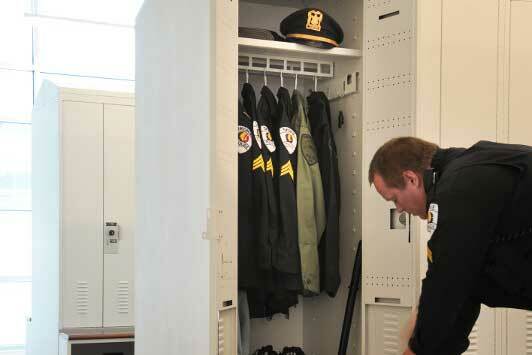 Skokie PD knew that its most valuable asset was its people. 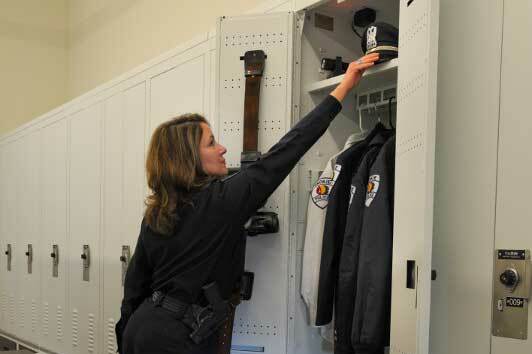 For this reason, it was important that each person in the department had a “home base”—a secure, organized place for equipment and gear. 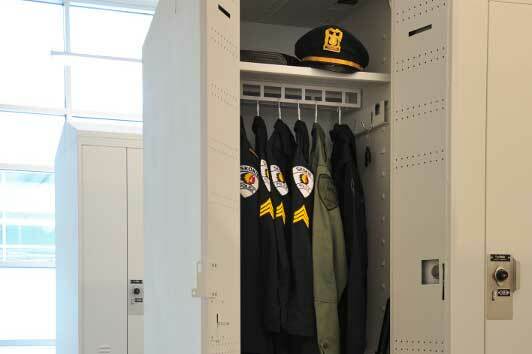 Utilizing heavy-duty, configurable officer gear lockers, the Skokie officers were able to customize their lockers based on individual needs with lockable drawers, duty belt hangers, adjustable full-width shelves, outlets for charging electronic devices, and bracket assemblies for hanging garments. 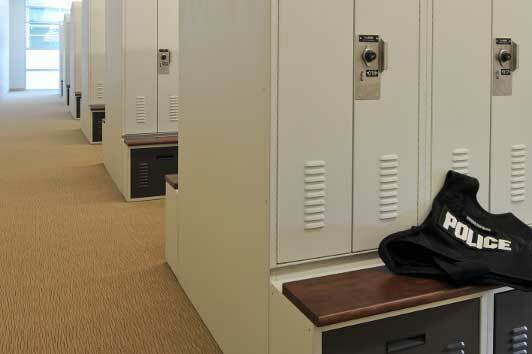 Each of the lockers also includes a bench made out of hardwood that doubles as a drawer—ideal for storing boots and drying body armor with the help of a pullout-drying tray. 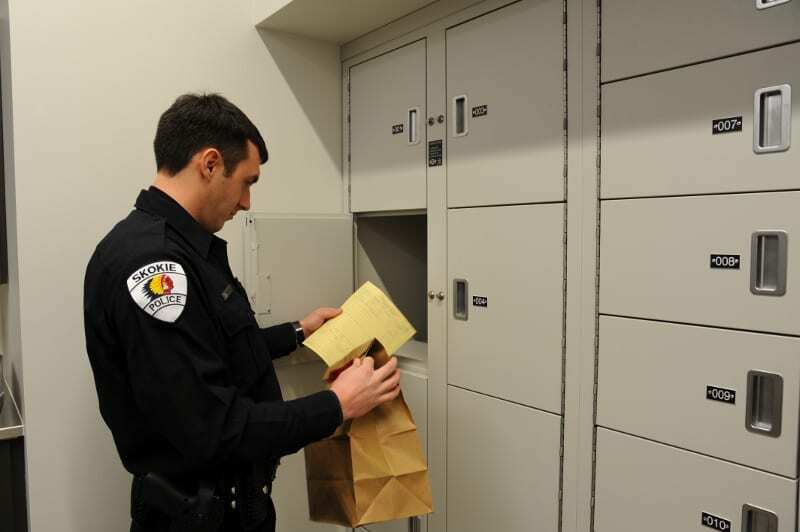 In addition to the personal storage lockers, it was also important for Skokie’s officers to store their gear bags when not out on patrol. 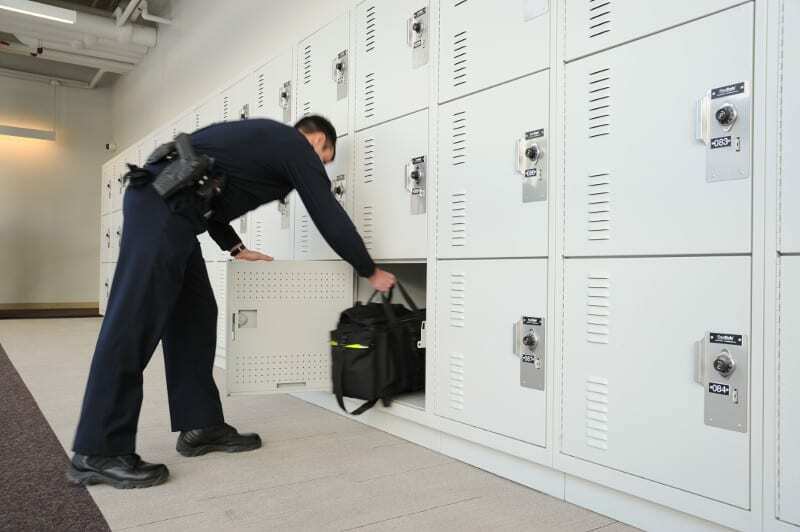 To assist with this, several banks of duty bag lockers were installed, ensuring a safe home for officer gear. This locker area was designed adjacent to the parking lot, creating an easy drop-off spot following a shift. Skokie’s department was especially proud of its Tactical Intervention Unit (TIU), whose mission was to respond to hostage situations and other special circumstances. For this reason, it was important that they have immediate access to gear. 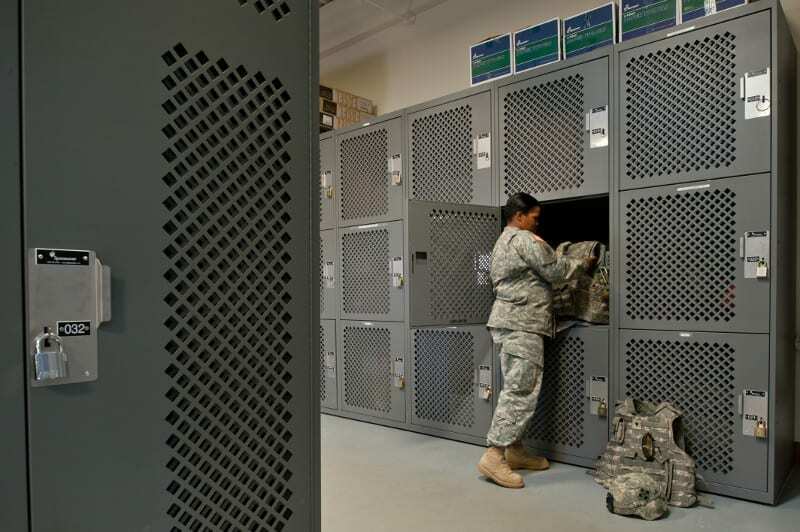 With this in mind, we designed large, open lockers from 4-post metal shelving with shelves of different heights to accommodate the unit’s helmets, weapons, shields, and gas masks. 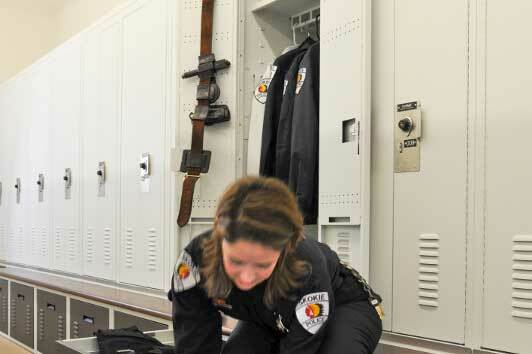 Similar to the personal storage lockers, these lockers were also equipped with electrical outlets and heavy-duty garment hangers to allow for the hanging of fully loaded tactical vests. 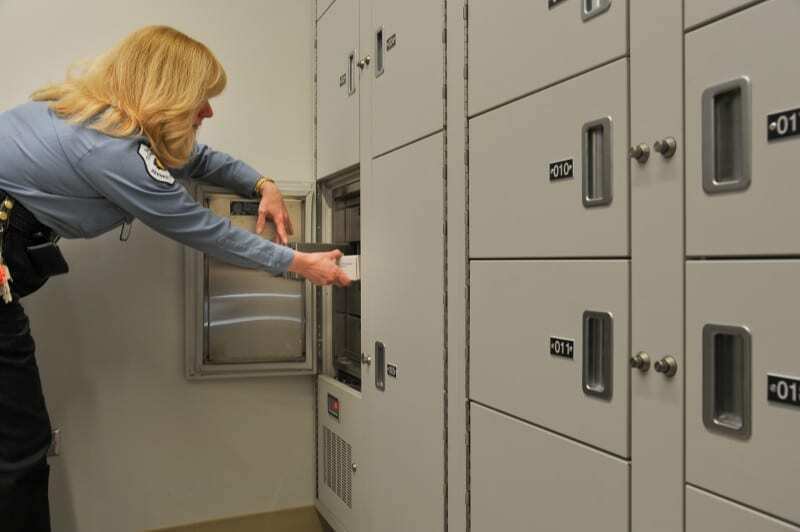 Taking care of officers and other personnel was also taken into consideration when designing the department’s temporary evidence storage. 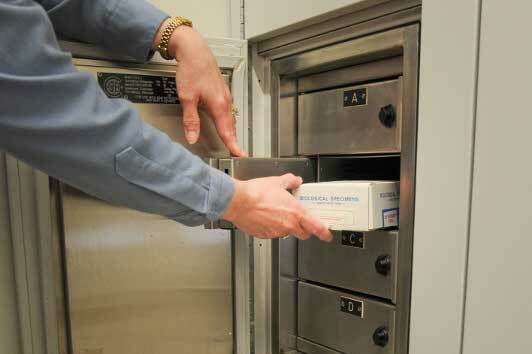 Maintaining a tight chain of custody was top priority for Skokie, who processed evidence 7 days a week, 24 hours a day. 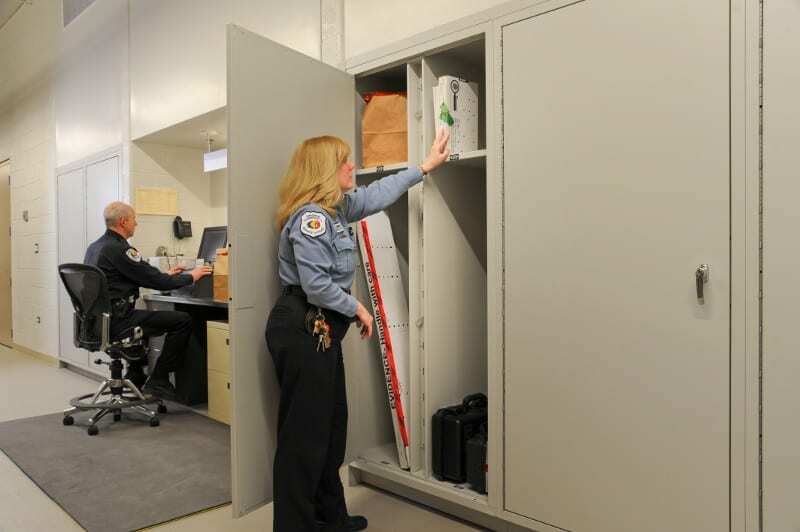 After learning about the types of evidence the department was processing on a daily basis, we designed a pass-thru evidence locker system that is built into the wall, allowing evidence to be deposited from one side and retrieved from the other side of the wall. 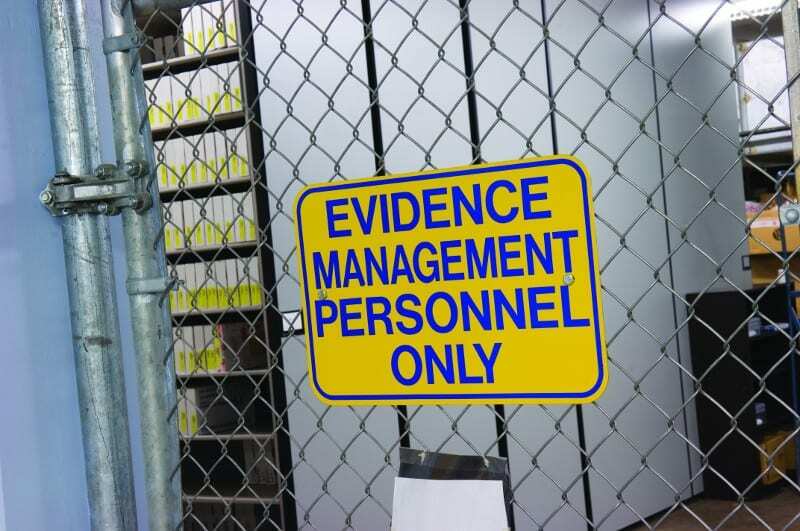 A refrigerated component for biological evidence was also incorporated and includes a built-in alarm to worn Skokie’s evidence technicians of temperature fluctuations. 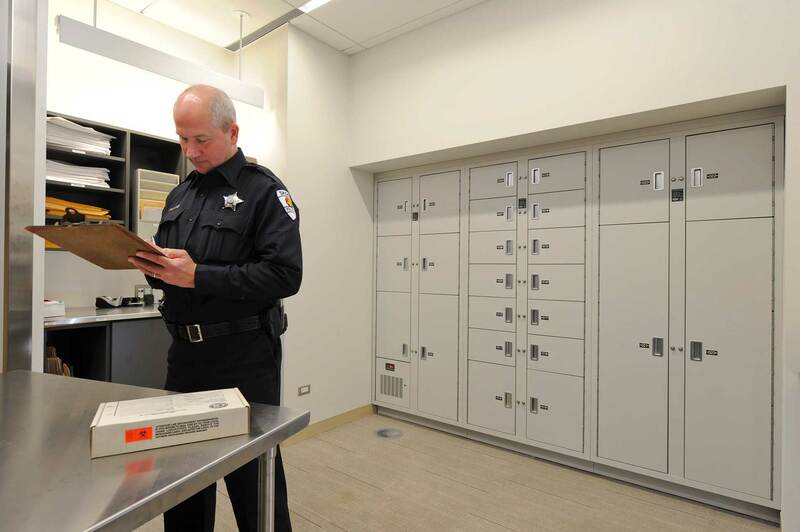 With the changes in Illinois state statutes for evidence, it isn’t uncommon for Skokie to keep evidence from many cases indefinitely—and in the old building, it meant a severe lack of long-term evidence storage. The village was also home to one of the largest malls in the state—causing a lot of evidence related to theft cases. 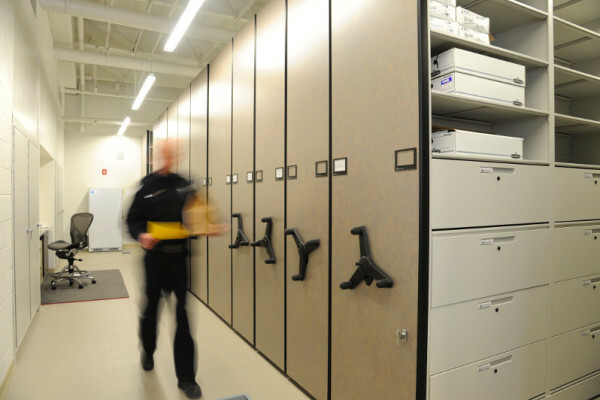 In the new evidence room, high-density compact mobile storage was utilized to organize the department’s current evidence inventory, while planning for future needs. In the public safety sector, communication is everything. We approach your command or dispatch center, operations control room, or whatever your “ship” may be with clean, mission-critical and ergonomic design expertise to ensure nothing is lost in translation. 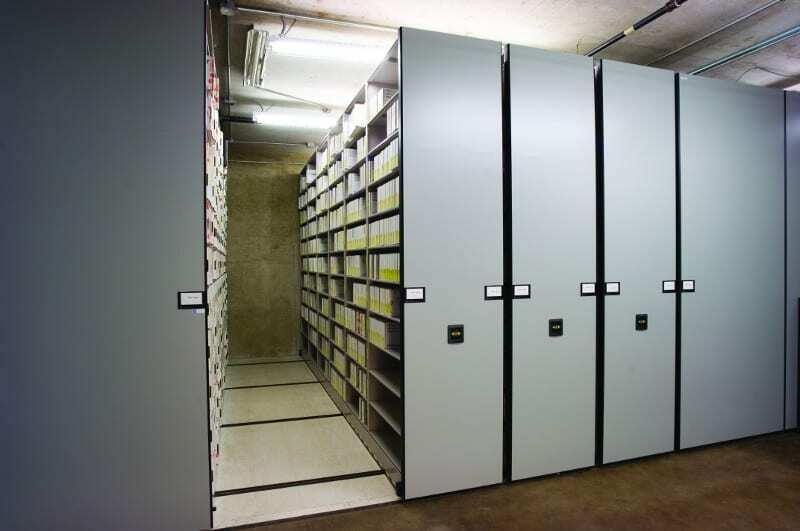 When the files you and your staff need are stored correctly and are easily accessible, time will no longer be wasted searching for the documents you need. 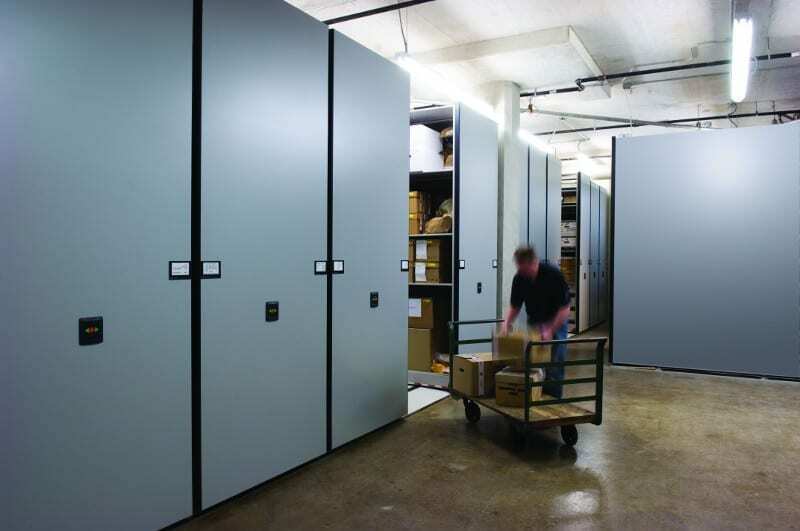 Our storage experts will assess your space and develop a unique solution to ensure your files are optimally stored. 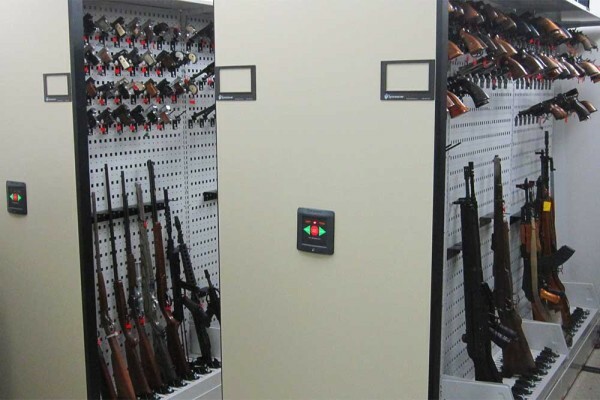 Proper gun storage can not only extend the life of your weapons, but can protect your team from any accidental injuries. 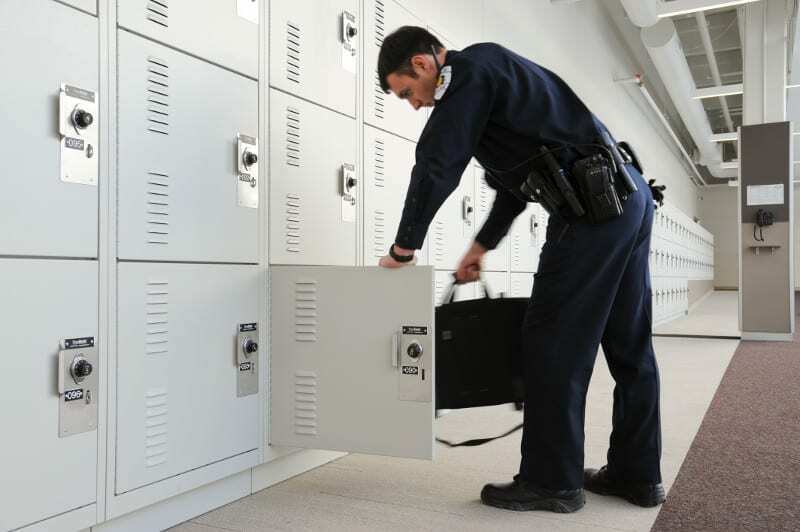 Our team of storage experts will listen to your needs and ensure your weapons are stored safely, securely, and efficiently. 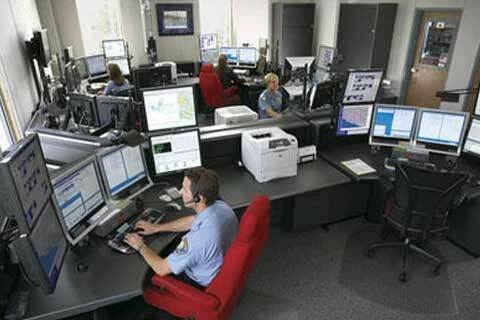 Partnering with Russ Basset, we offer state-of-the-art Desience Dispatch and Console systems. 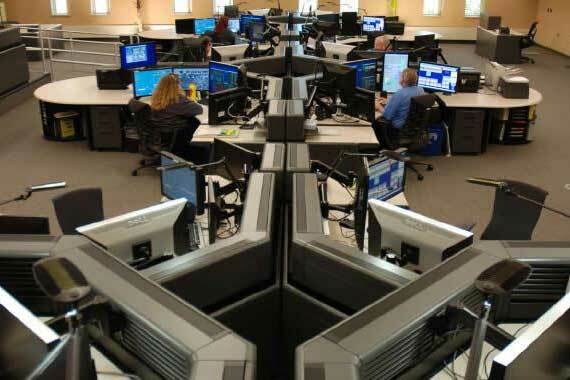 With their ergonomic and modular design, unmatched structural integrity, advanced technology integration, and customization options, Descience Consoles are ideal for command centers.